The ability to learn rules is at the heart of the ability to learn language. This thesis is a collection of papers tackling rule learning from various perspectives and domains – including visual, auditory, and speech domains – in both infants and adults. Using both simple XYX-, XXY-, or XYY-type rules, and more complex Lindenmayer grammars, we were able to gain insights into the rule learning processes of young infants and of adults. 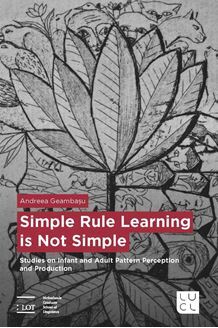 While we were unsuccessful in attempted replications and extensions of previous studies, it was precisely these failures that helped to provide a more nuanced picture of rule learning: even the simplest type of rule learning is far from straightforward. For infants, we find evidence for a repetition bias in both the visual and speech domain that is difficult to overcome, while for adults we show that the learning environment – the task used, the instructions, types of testing stimuli – are all highly influential in determining whether a simple rule can be learned or not. Furthermore, by studying patterns found in babbling we were able to hypothesize for the first time about the parallels between production and perceptual abilities with respect to rule learning.